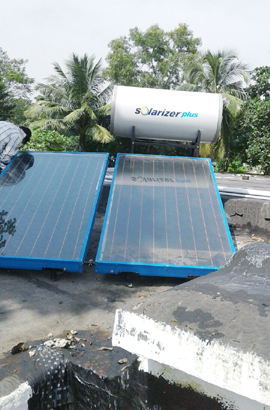 A solar water heating system, also known as a solar thermal system, uses sunlight to heat water for domestic or commercial purposes. Since this technology relies on a clean source of energy, switching to solar water heating will lead to a reduction of your domestic carbon footprint. There are different varieties of solar thermal systems: you can choose a flat plate or an evacuated tube collector, mounted in your roof or wall. Generally the system is incorporated to your existing hot water system. Typically, a solar water heating system would meet approximately a third of the hot water demand of a family of four. More specifically, if you invest in a solar water heating system for a three-bedroom semi-detached house.